After the tragic attacks in Paris, France over the weekend, local jazz fans remembered those whose lives were lost, before a peaceful performance by the Canadian Jazz Quartet, as part of the Brantford Downtown Jazz Series, Monday Nov. 16 at the Sanderson Centre. Sixty seconds of silence was observed prior to the concert and host Frank DiFelice encouraged the audience to reflect on being and living in Canada at that moment and to be grateful for living in this country. 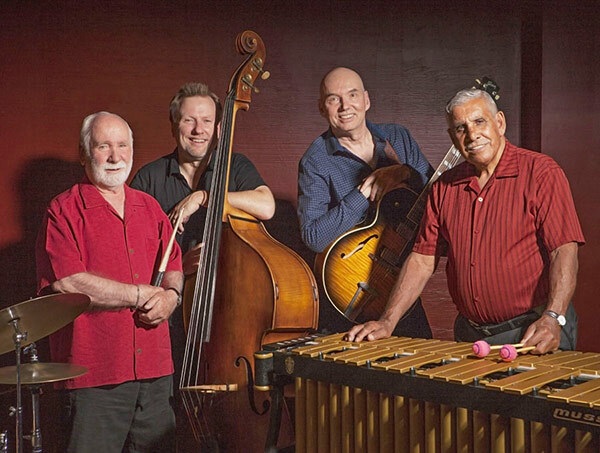 Bandleader and vibraphonist Frank Wright has been a part of the Toronto jazz scene since the 1950s. Throughout the evening he gave detailed introductions to songs, including lessons in history and he often reminded the crowd of references from another time. Frank Wright (left) with Frank DiFelice. Everything I Love, by Irving Berlin, was the opening song. Each band member (including Pat Collins on bass, Ted Quinlan on guitar and Don Vickery on drums) played strong solos on the introductory tune, a lengthy and showy classic. It was the first of three tunes written by Berlin, with the band also playing They Say It’s Wonderful (a slow, sad ballad, with the vibraphone clearly singing the vocal parts) and How Deep Is the Ocean, later in the night. One of the most prolific songwriters of the 20th century, Berlin lived to be 101 and he is credited for a catalogue of over 1000 songs, including White Christmas, Cheek to Cheek, Puttin’ On the Ritz and God Bless America. Blue Bossa, a Kenny Dorham number, was next. Vickery kept a tight shuffle beat, creating a driving, soundtrack feeling. Dorham was an underrated bebop trumpeter who recorded with Thelonious Monk and Sonny Rollins. He composed this jazz standard, which first appeared on Joe Henderson‘s album Page One. In the second set, there was a great blues atmosphere when the quartet played a Duke Ellington song called Do Nothing Till You Hear From Me. Some serious head-bobbing could be seen in the mostly reserved, calm audience. Attendance has remained solid for the series of late. Only about a dozen seats remained open for this second edition of the 19th season. Appearing in a Cary Grant movie from 1946, Lost April was a slow number that created the feeling of a cinematic dream sequence. The overly relaxing and often catatonic sensation made by the tone of the vibraphone was remarkable. Peter’s At the Plaza, reminded us that it is difficult to get through a show featuring this unique instrument without mentioning Peter Appleyard. The legend played the Brantford International Jazz Festival in 2009 and passed away 2013. Saving their most exciting song for last, a tune by Dizzy Gillespie called Tanga featured cooking guitar and fast drums. Wright described being speechless while being introduced to Gillespie by his friend Milt Jackson, as they shared a ride to a Toronto jazz club years ago. In a fitting, be-bop style end, the band stopped on a dime, completing another top notch concert in the Brantford Downtown Jazz series. The series continues Dec 14 with Toronto-based vocalist Alex Pangman & Her Alleycats.